vintage neon lamps: aerolux light company inc.
Aerolux was a prolific manufacturer of figural neon glow lights beginning during the late 1930s. Among all of the American glow light manufacturers, Aerolux had the longest run and continued well up into the mid 1970s. Duro-Test eventually acquired Aerolux around 1970. 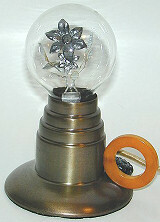 The earliest Aerolux lamps often had tubular envelopes and spring tabs soldered to the bottom of the lamp's base. These tabs allowed the lamp to be rotated in the socket for optimum viewing. Later Aerolux lamps, while under control of Duro-Test, can be found with arbitrary-tubular and hurricane shaped envelopes. Shown below are the Aerolux lamps that exist in the collection, broken down into sub-categories. Manufacturing dates are provided for each lamp when known solely based on the vintage literature that exists in the author's collection ranging from 1938 to 1974. This is by no means completely accurate, but will provide a good idea of how many years a particular lamp was being produced based on it's documentation in vintage literature. Since the same lamp was often produced in different shaped envelopes at different times, the dating takes this into account as well based on the old literature. Many Aerolux lamps had an argon fill and produced a beautiful purple glow. These lamps are documented separately in the argon section of this website and can be found here.